Trainer Karl Burke was delighted with the performance of Quiet Refection, who was given a very confident ride by jockey Dougie Costello when running out the length winner. The 7/4 favourite, who is owned by the 10-man Ontoawinner syndicate, along with Hubert Strecker and Burke himself, was always travelling powerfully for her jockey and she used her turn of foot to hit the front a furlong from home. There was a nervous moment as runner-up Kachy drifted across the track but it didn't affect any of the other runners as Quiet Reflection skated clear to land the six furlong contest. Burke was wreathed in smiles following the race. "I am absolutely delighted," said Burke. "It is a big relief as well because you see all your contemporaries and lads you grew up with - Richard Fahey and Kevin Ryan among others - all having winners at the big meetings. You are itching to have one and we have had a few near misses, so it is great to get there. Quiet Reflection is a very good filly. It was not the plan to be stuck in the middle like that and I was praying we didn't get a rough race. When she comes through she has a great turn of foot and it has got her out of trouble again today. I bought her at the breeze-ups and the lads at Ontoawinner were there and took half straight away. Elaine and my eldest daughter Kelly would not let me keep the other half so I sold 35 per cent to Hubert Strecker. I was determined to keep a piece because we have always thought a bit of her. She's run some amazing races in her time. She won a couple of Group races last year but to come here and win this race at Royal Ascot - it'll take some beating. I haven't seen the replay but it wasn't the plan to be stuck in the middle like that. My biggest fear is that we'd be in a barging match - she's not a huge filly so I said to Dougie to keep it simple. As it happens, we were stuck in the middle but the runner-up running across the track opened it up a little and she used that turn of foot to great effect. "It's gone well but we've got a great team behind us at home and you can't do it without the horses. I only came down yesterday and when you see the likes of Michael Dods' horse getting beat (Mecca's Angel who was beaten favourite in the King's Stand Stakes on Tuesday), it must be a horrible feeling to go there with a strongly fancied horse and it get beaten. You just hope and pray that you've done your job properly - especially when horses are travelling away. I'm a big believer in looking at them in the morning and when I saw her first thing, I was comfortable. She's in the July Cup but whether that would be the right thing to do, I'm not so sure. The ground would be dependant there as I wouldn't want to see her running on those sort of undulations on firm ground. She's been on the go a long time. She started her prep before Christmas so maybe the right thing to do would be to give her a break, come back to Haydock for the Sprint Cup and then back for Champions Day here." Simon Bridge, who runs the Ontoawinner syndicate alongside his business partner Niall O'Brien, could hardly contain his excitement immediately after the race. "Bloody hell!" exclaimed Bridge. "Incredible! What can you say? Group One winner! This filly has been pretty impressive from day one to be fair. You think you've got something that might be ok sometimes! Karl said after she'd done a piece of work that she might be above average - I think she's just proved that she is today! I'm delighted. There are 10 people who own this particular filly. We've go 42 horses in total with various trainers - we've just grown and grown over the last five years." "I haven't slept for a week thinking it could happen," said O'Brien. "You don't allow yourself to think you can. For an operation like ours - we've only been going five years - it's amazing. When Simon and myself first dreamed this up, we'd had horses before and I thought it was mad to do syndicates again - they're too much hassle. We've got some fantastic owners though. It's richly deserved. To come here with a syndicate horse having paid only £45,000, it's unbelievable. Taking on the best owners in the world as well - all the owners deserve this moment." The Tom Dascombe-trained Kachy (14/1) was an unlucky length second. Having led on the far side for most of the race and travelling kindly in the hands of Richard Kingscote, the son of Kyllachy hung left across the track to the stands' side rail, costing the colt vital momentum in the six-furlong contest. The three-year-old stayed on strongly but was unable to peg back the winner Quiet Reflection (7/4 favourite), trained by Karl Burke. Dascombe said: "I don't know why the horse has hung. We wanted to get a lead and Richard [Kingscote] just said there was nothing fast enough in the race. "When we ran him in behind horses, he just ran like a spoilt child so we wanted to lead but not take him out of his rhythm. I think Richard did the right thing in taking him away from the other horses early doors. "For all I could see we were the winner all the way but I don't want to take anything away from the winner. She has beaten us but Kachy has ended up on the stands' side rail. "I don't know what to say really we might have to go back to five furlongs and put a pair of blinkers on him. "Second in a Group One is still a second in a Group One. I'm absolutely thrilled for Karl Burke, he is one of my best mates so if I'm going to lose to anybody I'd rather lose to him." Richard Kingscote commented: "It hasn't helped with him hanging across the track. I just felt that the ground was slightly tacky and he would have appreciated better ground. He is still slightly immature but he has run a cracker." Aidan O'Brien, trainer of the third home Washington DC, remarked: "He ran very well and I am very happy. He would prefer the ground faster but he ran a great race." 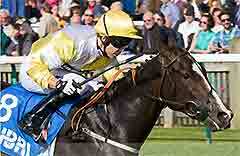 Ryan Moore, jockey of the son of Zoffany, added: "My horse ran a very creditable race. The winner is smart and the second isn't bad either."